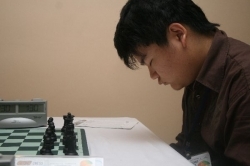 The fourth round of the World Youth Championships 2007 indicated the early leaders of the tournament. However, there are still seven rounds to go until the end. You can find more details and the pictorial report at the link below in several hours. Round 5 and 6 are going to be available tomorrow morning. 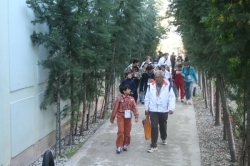 Tomorrow is a free day with an excursion and problem-solving competition. Turkish national team training with FM Alper Efe Ataman. The other teams also work. In women U18 Category, WGM Anya Corke and WIM Mary Ann Gomes are the only two players with perfect score after four rounds. WIM Katerina Nemcova and local hero WIM Betül Cemre Y?ld?z who won against WIM Ivakhinova in style after a nice exchange sacrifice share the third place. In men’s section, in the top 2 boards, IM Margelashvili drew against GM Popov and IM Pruuijssers drew against IM Grigorian. The other player with the perfect score in the groups, Caspi lost against IM Warakowski. Left: Ahmed Almuaini from United Arab Emirates Right: Mustafa Y?lmaz from Turkey seems to be determined to win. 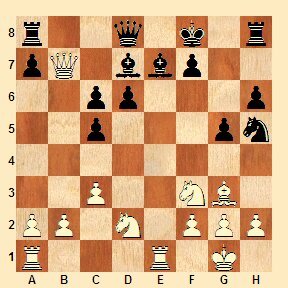 Unfortunately he lost in a complicated position with two rooks and the queens on the board. In U16, FM Piorun from Poland won against Azerbaijani IM Durarbeyli. 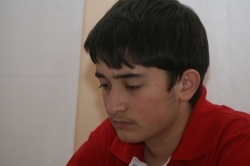 The other Azerbaijani player with the perfect score suffered a loss against FM Recuero from Spain. Turkish star Mustafa Y?lmaz lost in an interesting position with major pieces on the board against FM Krejci of Czech Republic. 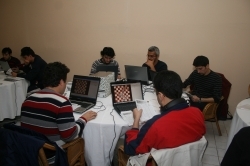 Tsatalashvili and WFM Repina won against WFM Kulon and Agrest respectively to remain at the top. WFM Ton made a draw against Beridze while Girya won against Winkelmann. Reigning champion WFM Guramishvili from Georgia who suffered an early loss is back on track with 3 points. European Champion WFM Öztürk won against Algerian Hamza. In U14 Girls section, WFM Paikidze is leading with 4 points has to share the first place with Mohana, Baciu. 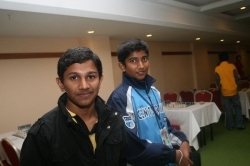 In U14 Section, the higher rated Sethuraman against FM Vidit won the Indian derby while Kalmykian IM Sjugirov also won against Ipatov. Other players with 4 points are FM Robson and Kanarek. 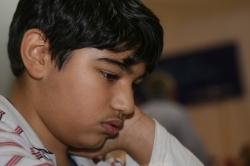 Top seed of the U12 section FM Ilya Nyzhnyk won yet another game against FM Barros from Colombia. 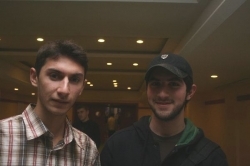 Naroditsky and Monev also collected 4 points. Cankut Emiro?lu, former World Schools Champion won against Kaphle and he collected 3.5 points. 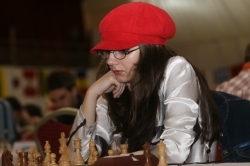 In Girl’s tournament Galunova, Lezhepekova, Efroimovski, Ziazulkina and Vujnovic are at perfect score after round 4. In U10 U8 World Champion Prince drew against Uzbekistani Artemenko. Duda, Wag and CM Thai have perfect score in the group. 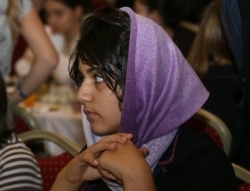 In the girls category of the same age, there are 5 players with 4 points : Styazhkina, Chiang, Aripova, Guo and Khademalsharieh. 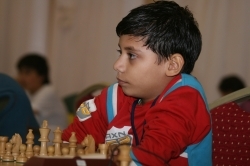 In U8 section Volkan Sevgi from Turkey won another game and together with Qasimov who won against the top seed of the tournament Shembuliak, Savenkov and Nguyen reached perfect square in the group. In U8 Girls, Abdulmalik from Kazakhstan, Furtado from India, Nguyen from Vietnam are leading with perfect score. A girl with a red hat and Turkish player in Seray Tulay. 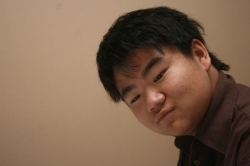 A player in Under 18 trying to concentrate before the game, though flash bounced right off his face he still seems cheerful. Left: Adrian Mikhalchishin and Özgür Solako?lu watching the games live. Right: Koral, one of the main heroes of the event, administering accreditation and director of the tournament who was newly entitled International Organizer and Faruk ?ahin from Ultra Tourism.